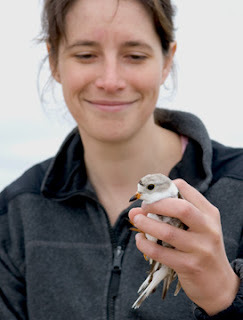 Piping Plover are again nesting at Whitefish Point! 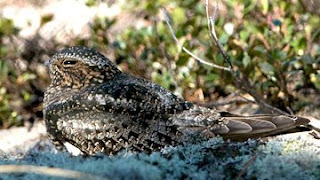 The above photo is of Erin Roche and the nesting female. Erin has been working on the recovery program for this federally endangered species for years, and is currently working with them for her PhD. In impressive fashion she and others from the Piping Plover crew, sorry I can't remember all of your names, came to the Point and found the nest. They were able to band the female and set up an enclosure to protect the nest. Upon being released the female walked just a short distance, stretched and relaxed a bit (photo below), then returned to her nest. 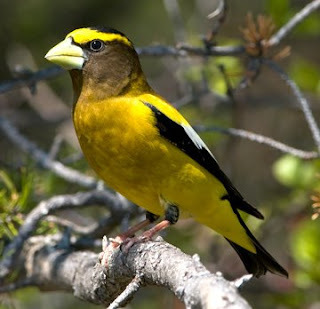 This is the first nest to be found at Whitefish Point in at least 2 decades. Congratulations to Erin and the whole crew, and thanks for letting us observe your work. We'd like to thank all of you who pledged to the 2009 WPBO staff birdathon. It was a huge success and over $6,000 was raised for the summer owl research! This is crucial support, without which it would not be possible for us to continue this unique project. We find it impossible to properly express our thanks through words on the blogs. We are simply very grateful, thank you. Well the spring research seasons have officially ended. Sightings of Pacific Loon, Parasitic Jaeger, and Marbled Godwit added some excitement to the last week of the count. 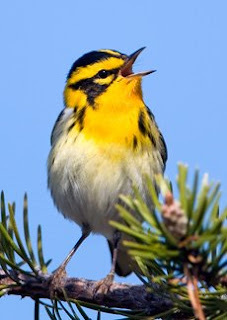 Overall songbird activity, particularly warblers, was fairly low this spring. It has continued to be a cold spring and activity has remained fairly slow into June, but there continues to be some activity. 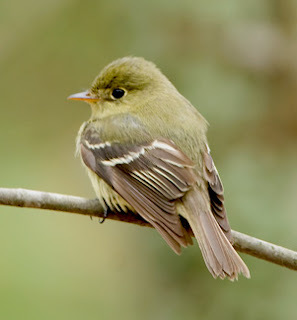 Recent sightings include Green Heron, White-rumped Sandpiper, Olive-sided & Yellow-bellied Flycatchers, Cape May, Blackpoll, & Mourning Warblers. As always very impressed with the photos. The Blackburnian is incredible. 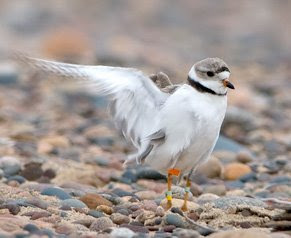 Kudos to the Piping Plovers and all the efforts to allow this bird greater hope of a successful brood this year.